An exciting technology has been developed by a company from Santa Clara, California named Foveon. 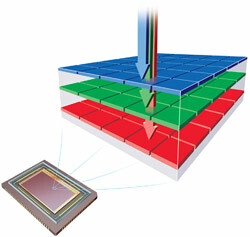 The technology is called X3 which is the world's first full-color image sensor. Before I get into the technology, lets just get some background information on the company itself. Before founding Foveon, Dr. Mead was an author and teacher. He has contributed to over 100 publications on subjects such as solid-state physics, microelectronics, and biophysics. He taught at the California Institute of Technology for over 40 years. He is quite well-known in the tech industry and was actually part of the group that founded Intel. That just gives you an idea about who is behind the company, buts lets just dive right into the good stuff, X3 Technology. As I mentioned earlier, X3 Technology is the world's first full-color image sensor, but what is that? First you'll need to understand what an image sensor is. An image sensor is the chip in a digital camera which captures the light colors in order to create an actual image. This is a side profile of the image before, you can see only one wavelength is able to pass through. Notice also that there are more green mosaic sensors then any other color, in fact the split is 50/25/25 which means a typical mosaic sensor captures 50% green light and only 25% of blue and red light. Right there we can see that there is an issue that will definitely affect color quality. Keep in mind though there are other systems like Fuji's Super CCD which uses a honeycomb architecture of octagonal pixels that are arranged on a diagonal axis. Note though it uses a mosaic filter to detect colors, so it is still limited to only one color per pixel. 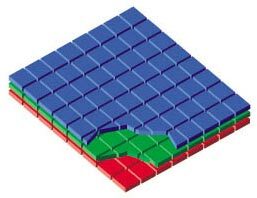 Above is the difference between mosaic and X3, notice how the corner part shows two more layers below it, while mosaic capture had none. 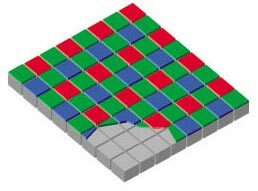 Now red, green, and blue wavelengths of light can pass through at each pixel rather then only one. This means that rather than having that 50/25/25 ratio or even a 33/33/34 ratio, you get a 100/100/100 ratio at every pixel location. But you may ask, how do digital cameras capture the colors that they do now if they can't capture 100% of the RGB colors at every pixel? Basically image sensors that use the mosaic capture system have to rely on interpolation for the colors that it does miss. And making a guess at the colors is complex, which means it takes processing power, the more accurate the image sensor can get, the more processing power it has to use. Since guessing that many colors will probably never be 100% accurate, it obviously leads to color artifacts and loss of image detail. With X3 technology the pictures come out sharper, the colors are truer, and there are fewer artifacts. Since X3 does not need to interpolate it means it does not need to rely on processing power. This significantly reduces the hardware requirements, simplifies the design, and minimizes any lag time between each shot.